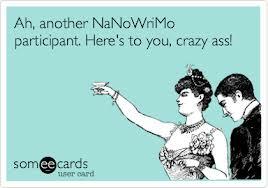 If anyone’s been wondering what I’ve been up in the month of November…wonder no more….I’ve been doing NANOWRIMO! This is the annual challenge for budding authors to complete a 50k word novel in 30 days. My first Nano adventure was in November 2001 and I wrote 30k words….and stopped….long before the end. I gave up completely and started again a few years later in November 2004….this time, I also gave up at around the 15th of the month. Also had a stab at it in November 2006 but failure yet again. This time in 2012, I found a buddy and we got writing…and guess what? I wrote until the 30th and got up to 41k words….and I’m claiming a victory. I didn’t reach the allotted word count nor have I finished the my novel but I’m on the way…and will be finishing this baby before the end of the year. 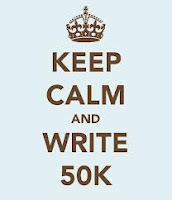 -All of the regular chores, work and writing a 50k word novel too…phew!! Doing Nano brought out some of my demons. When you have dig to deep into your psyche for inspiration, it can be like opening a can of worms....some of the ugly stuff comes to the surface. You have to be constructive and find a home for the dark side. Fiction allows you to do that; you can pour vengeance and redemption into your characters. You can let them walk in your shoes and you in theirs.You can live out your fantasies and phobias. Post-Nano, I have big respect for writers. They're stoic, talented, finger tapping, reclusive geniuses. If you can't shut yourself away from distraction and the human race then you'll never be a good writer. Luckily for me I enjoy my own company so the writing life is for me. So what if your writing never sees the light of day. Self-expression is more important than self-aggrandisement. I've been writing stuff for years that the world has never seen. Validation is good but not if you have chase after it. Writers are right to write, right? I’ve done the best I can do and I can’t ask anymore of myself. I’m proud of my achievement. So what’s my novel about? A romantic comedy entwined with a mystery suspense: ANIMAL ATTRACTION. When I complete it, I’m going to post it on my new soon-to-be-launched website for all my readers to take a look. So that’s November out of way but the writing goes on. Thank you Carolyn buddying up with me….I’ll show you mine… if you show me yours!